Rising high above the Belle Fourche River, grasslands, and ponderosa pine forests, Devils Tower commands attention. This monolith has long been a beacon, attracting people and capturing their imaginations since prehistoric times. Today, it continues to hold different meanings for many people including American Indians, local ranchers, rock climbers, and thousands of visitors from near and far. The Antiquities Act was created to protect areas of cultural importance, such as the prehistoric Indian ruins found at Casa Grande Ruins National Monument in Arizona and at Chaco Culture National Historical Park in New Mexico. President Roosevelt determined the phrase "objects of historic and scientific interest" could be applied to natural features as well. By establishing Devils Tower National Monument for its geological formation, he broadened the intent of the Antiquities Act. President Roosevelt went on to create a number of other monuments including El Morro, Montezuma Castle, Petrified Forest (now a national park), and Jewel Cave. Since 1906, 17 presidents have used the Antiquities Act to set aside national monuments. The Antiquities Act is one of the most important pieces of conservation legislation in America's history, laying the groundwork for the National Park system. Located in northeastern Wyoming, Devils Tower National Monument protects mountain and northern plains species distinctive to the Black Hills. Surrounding the Tower are ponderosa pine forests, prairie grasslands, mixed woodlands, and the Belle Fourche River. Wildlife, including whitetail deer and wild turkey, range across the 1,347 acre monument. Just beyond the Belle Fourche River is a prairie dog town where these small creatures live, play, and delight visitors. A dominant landmark of the Northern Great Plains, travelers can see the Tower from miles away. Many wonder, "How was it formed?" Approximately 50 million years ago, the Tower formed when magma, molten rock, was forced up from below the earth’s crust, following fractures and weak spots. The magma pooled below the land surface and slowly cooled beneath softer sedimentary rocks. President Roosevelt called the Tower "an extraordinary example of the effects of erosion,” for over time, ancient rivers washed away the sedimentary layers revealing the Tower. People come from around the world to see it, and some even climb it. Climbers have ascended the Tower's columns for more than 100 years, and Devils Tower continues to be a premier climbing site. Artists, photographers, writers, painters, and musicians are also lured and inspired by the Tower’s dramatic character. 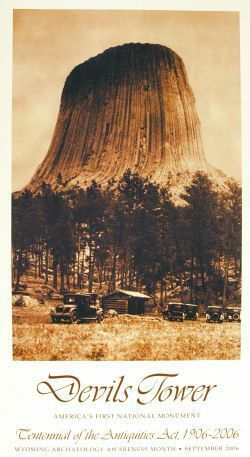 In the words of a Writer-in-Residence participant, "At Devils Tower, one becomes so aware of ‘deep time’ – time that is counted in millions of years, instead of hours or days, and knowable only through small details of the eroded landscape." No mention of the Tower's cultural significance appears in the proclamation that made it a national monument, but its cultural importance is well established. To the Lakota, the tower is Mato Tipila, meaning Bear Lodge. The Arapaho call it Bear’s Tipi. To the Cheyenne, it is No Kovehe, Bear Peak. To the Crow, it is Daxpitche’e Awaasuua, the place of the Bear’s House. The Kiowa, call the tower Tso-i-e, meaning Standing on a Rock. More than 20 tribes recognize the Tower as a sacred site, and many American Indians use it as a place of worship. Most of the ceremonies that take place are conducted by small groups or individuals who have gathered for prayer, pipe ceremonies, the tying of prayer cloths, or to conduct vision quests. Romanus Bear Stops of the Cheyenne River Sioux tribe explains: "The Tower is vital to the health of our nation and to our self-determination as a Tribe. Those who use the butte to pray become stronger. They gain sacred knowledge from the spirits that helps preserve our Lakota culture and way of life." People come to the Tower for many reasons. For some people, the Tower is a fascinating geologic formation. To others, it is a sacred place. And for others, it is a place for recreation. For all that come to visit, Devils Tower National Monument is an amazing sight and continues to be worthy of its designation as America's first national monument. Text By: Christine Czazasty, Chief of Interpretation, Devils Tower National Monument.